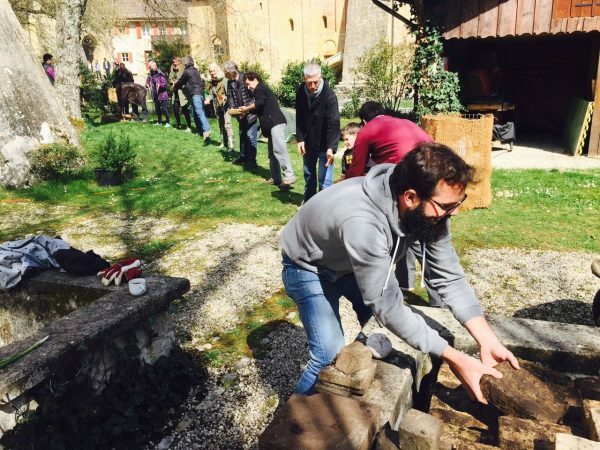 What is the role of an artist-in-residence project in a small village on the Swiss countryside in the second decade of the 21st century? From 2015 till 2018 Sally De Kunst and a community of artists and other shareholders engaged in re-inventing Arc artist residency. There was no pre-set agenda or theory for this; we simply go tour hands dirty. Re-inventing the residency became an ongoing investigation that was put into practice at Arc and in its everyday routines, and that would involve a growing community of many more others over the following years. Sally De Kunst was the director of Arc artist residency in Romainmôtier (CH) from 2015 till 2018. After a BA in Graphic Design at St. Lukas in Brussels (BE), a BA in Art History at the University of Ghent (BE) and an MA in Theatre Studies at the Universities of Glasgow (UK) and Ghent (BE), Sally De Kunst worked from 2000 until 2003 as a dance, theatre and film critic for the Belgian newspaper De Morgen. From 2003 until 2006 she was the dance and performance programmer at STUK arts centre in Leuven (BE). Between 2006 and 2007 she worked as a co-curator for two international exchange platforms: Monsoon, an Asian-European exchange (Seoul) and Expedition (Amsterdam). Between 2007 and 2013 she was the director of the Belluard Bollwerk International, an arts festival in Fribourg (CH). In 2010, 2011 and 2012 Sally De Kunst hosted Watch & Talk, a discursive residency-workshop for young artists at the Theaterspektakel festival in Zurich. She has also been a contributor for different magazines and publications, including Etcetera, Journal for Visual Arts Practice, On Curating, Frakcija, Substitut and Galerie Fortlaan 17.